Sherrie Scraps with passion: Feel Better Soon! I hope you are having a great week so far...can you believe it's almost August? Yikes, the time is flying by so fast this summer, don't you think? I have a fun project to share with you today! Yup, little by little I am getting in my craft room. Yeah! I made this little treat for my friends little granddaughter who hasn't been feeling well and thought this would brighten her day. I also have the honor of sharing one of the new die's from the new release that My Creative Time is a sneak peeking today. It's called the "Trio Stitched Banner" metal die. I happen to have won it on a challenge and could wait to show you a peek to! Be sure to head over and take a look at all the fantastic projects by Emma and her DT. I started with a mini craft bag I picked up at Annie's Paper Boutique. I cut a small panel of polka dot pattern paper from Fancy Pants at 2 x 2 3/4 and a pretty border on each side using a Martha Stewart punch. I adhered that down with Extreme adhesive by Tombow. The banner is My Creative Time's new Trio Stitched Banner Metal Die. It has 3 fun banners in this set...super fun for your projects! I stamped the sentiment on the banner with an oldie but goodie stamp set from My Creative Time called Pain, Pain Go Away. I added a yummy double bow with Pink Bubblegum crinkle ribbon from My Craft Spot along with the fun little tag. I used the Tiny Tags metal die and stamped the sentiment with the Tiny Tags stamp set. I filled the bag with yummy chocolate...that would make anyone feel better, right? This is adorable!! I just love the colors and that sweet little girl!!!!!!!! I think that should put a smile on the girl's face. Super cute. I like how you attached the tag to the bow. What a GREAT project with the new die!!! How sweet and I really think this will make her feel much better.... Love all the added touches to this treat holder... sooooo cute! This is so absolutely adorable, Sherrie!! That little girl is so sweet!! I love her lip gloss - so fun!! The sparkly headband is awesome!! All of the added touches are perfect!! This will definitely cheer her up - it's fabulous!! This is so adorable it would make anyone feel better the girl image is so cute. Have a Blessed day, DIANA L.
What a darling little project, my friend! She will feel so much better with this token of love. The image is adorable, especially with the little touches you added! Beautiful background and I love the sentiment hanging from the ribbon. :o) Lovely work, Sherrie! I hope you have a wonderful day! aw, so adorable! and great little get well gift! 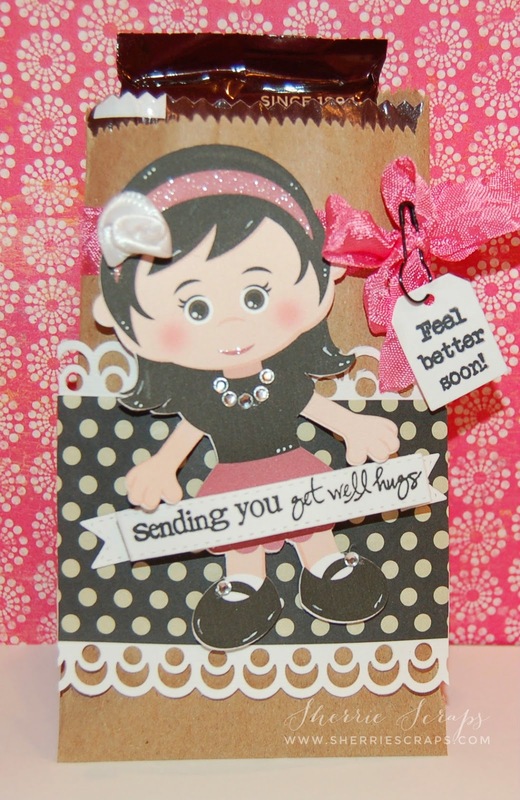 This is the cutest get well card! I love it! Oh my goodness.. this is just adorable!! That little girl is sooo cute!!! I am so sorry I have not been around to visit, I've been battling a lot of health problems but hope to come back and visit again real soon! Miss you!! This is just adorable!!! Love the precious image! Don't you just LOVE the print n cut feature! Love the mini craft bag! Oh my goodness this is the cutest tag!! I LOVE her!! Adorable Sherrie! Thanks for playing along with our challenge at Silhouette Challenges! Oh my gosh - this is absolutely darling! What a sweet little image, she is just cute as can be and I love the gems and glitter you added. What a fun little treat bag - I'm sure it will brighten up your little friend's day in a big way! Awesome treat bag! The little girl is the sweetest thing ever! Fabulous colors and patterns! Sherrie ~ This is ADORABLE!! LOVE that that sentiment fits on that banner die! EEK! 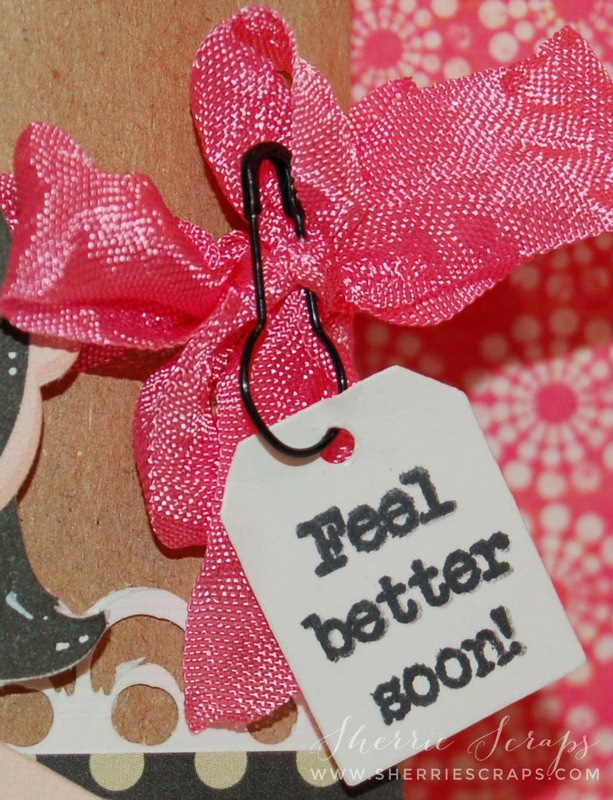 What a FABULOUS way to say feel better too! LOVE the die cut too! CONGRATS on winning this too ~ its going to work on so many wonderful things!!! Can you believe it's almost August! YIKES! Where did our summer go??? As always sweet Sherrie ~ AMAZING job! What a adorable treat bag!! Love it!! Have a great day. Oh this is the cutest little treat bag!! I love this little girl and of course that awesome bag!! Great job Sherrie!! I can't believe it's August, I'm starting to panic that the Holidays are around the corner. I just love the Holidays but I feel like they are coming to fast!!! This is darling Sherrie! I can't believe it is August either, I'm soo behind on my blog, but we've been doing a lot of tun stuff as a family, there's only so much time in the day I guess! Hope to catch up with everyone soon! I love this !!!!! I would instantly feel better upon receiving this wonderful creation !!! This is full of cuteness and absolutely perfect !!!! Hope you have a wonderful day my friend !!! This is so beautiful. Thanks for joining us at DCD for our Anything Goes Challenge. Super cute card, Sherrie!! Love the print and cut image - so cute! Thanks for joining the fun at My Craft Spot! So very sweet! Love that little hanging tag on the bow! Thanks so much for joining us at My Craft Spot! This is just the cutest! So so sweet! This is so cute!! I love the way you've dressed up your gift bag. What a super treat for your friend's granddaughter. I hope she's feeling much better now!